Most people who are dissatisfied with some aspects of their lives don't really know what they want instead. They'd be hard-pressed to describe it in detail and probably only have the vaguest of ideas about it. So there's nothing concrete to focus on and, unsurprisingly, they don't know what to do. They can't think of any way forward because the goal is indistinct and all possible actions seem irrelevant. If you've had this vague desire, this "itch", for a while but never really done anything about it then the desire isn't strong enough. Clarifying your goal is essential. How can you be excited about something that's fuzzy and ill-defined? Then, with a clear goal, you need to work on building your motivation, your desire to achieve the goal. Without that driving force you won't finish the job. The biggest frustration for people who are feeling stuck is not knowing what to do. If you're in this position then you face the prospect of doing something you haven't done before and you lack the skills. You're afraid that you'll fail and you feel that failure will reflect on you as a person. It will show the world that you're not good enough. But really, it's not about whether you're "good", it's about the fact that you lack certain knowledge and skills. So what have you always done in the past when you needed new knowledge and skills? You took the time and effort to learn them! Need to drive a car? Go and get lessons! Need to use a new software package at work? Read a manual and go on a course! Need to change your life? Go and...what exactly? And there's the problem. The skills you need are not taught in school or in workplace training. They are inside your head - about how you think. Look again at the list of three things you need. The first is an idea. The second is a state of mind. The third is knowledge plus "tools and techniques". All are internal to your mind, even the tools and techniques as you'll see later. This really is the critical question, isn't it? Whatever you might say you want from life, it'll be something that you think will bring you happiness. The unwelcome truth is that the things many people strive for - wealth, possessions - can't guarantee happiness. They may counter some of the reasons for feeling unhappy, but that's not enough. If you believe that happiness can only come after some goal or some prize has been attained, then you're condemning yourself to feeling unhappy until then - with no certainty of when that might occur. So let's be clear about this: happiness is a state (emotional, mental and physical). And the state you're in at any moment can be under your direct control, a matter of choice. You don't have to let anything, or anyone, make you happy - or sad, or motivated, or confident, or afraid. You can choose the positive state that you want to experience. How do you change your "state"? I used to think that the way I felt at any moment was a direct result of where I was, who I was with and what was happening around me. If I felt unhappy then I had to try and change some of those factors. But I often found that I couldn't change things: either it was impossible, or I was just incapable - and that thought made things worse! Then I came across Neuro-Linguistic Programming (NLP) and, much to my surprise, found that it made a massive difference. Now, bear in mind that I'm a graduate physicist and worked for 28 years in research and development so I'm not easily impressed by "magic" cures for anything. My training and my work had all been about hard, physical reality. I believed (and still do) that what we think about things is irrelevant to how things actually are or how things work in the physical world. But what I learned was that the way we experience the world, and particularly how we feel about it, is almost entirely a matter of what's happening in our heads, irrespective of what's "real". It's as though there's a software model of the world in your brain and it's the model that you experience. It's not overstating it to say that you live in your model world rather than in the "real" world. And that's the crucial thing. The physical world is mostly outside of your direct control, particularly the other people contained in it! But your internal model is completely under your control - if you know how to control it! With this book you'll learn the techniques to change the mental programs that you've developed over the years. Those programs determine how you react in all situations: what makes you happy, what makes you feel sad, hurt or depressed. When you've learnt and practised the methods in the book, you'll understand what's been holding you back and you'll be able to take control. You'll also have a penetrating insight into what other people are thinking, understand why they behave as they do and so be able to influence them more effectively. This will be key to getting what you want because it probably requires others to help you. The emphasis is on you working through the exercises in each chapter, so how long it takes is up to you. You'll probably find useful and surprising insights in the text, but the most value will come from the things you discover about yourself. And the really big things will feel like sudden revelations: suddenly seeing something that's been there all the time but you never noticed it before. 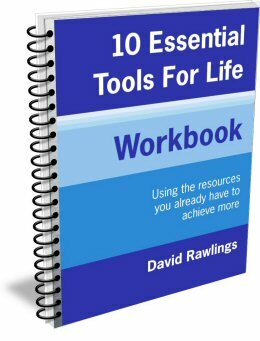 The price of the workbook is £26.97 (including shipping). Click the button below to go to the secure payment page. Please make sure you enter your full postal address for delivery. Get your hands on this book and get started!